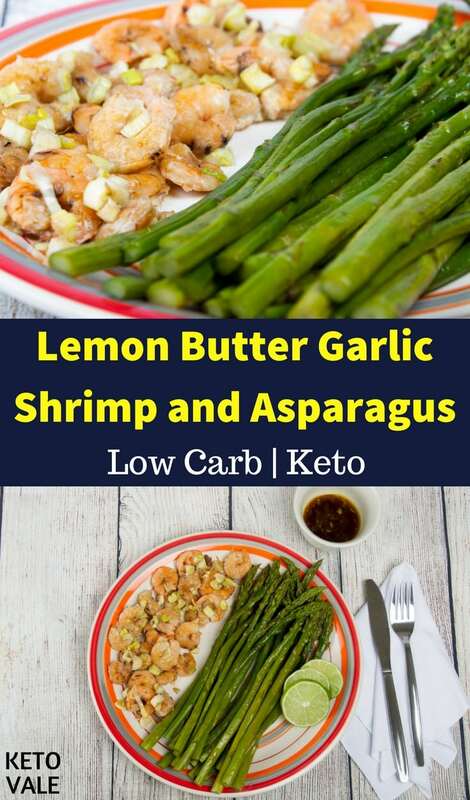 This One Pan Roasted Lemon Butter Garlic Shrimp and Asparagus dish is a delicious way to get all the fats, protein and fiber you need to live the low carb lifestyle. All you need are medium-size raw shrimp and asparagus as the main ingredients. 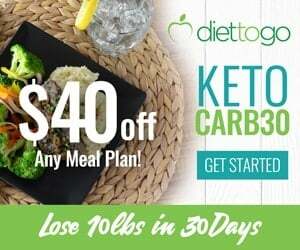 There are many ways you can season this dish by using all of these, or a combination of these ingredients such as butter, olive oil, garlic, paprika, red pepper flakes, parsley, lemon juice, ginger, leek, coconut aminos, salt and pepper. 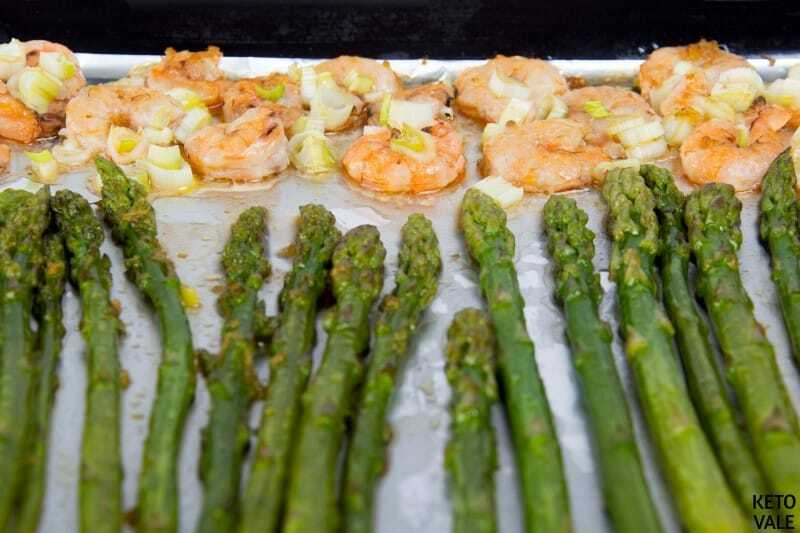 Simply marinate shrimp and asparagus and let the oven do the work. 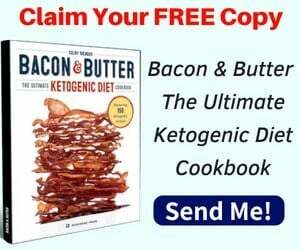 It is full of amazing flavors and tastes. 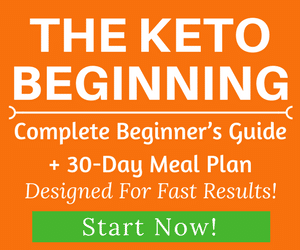 Moreover, it’s super quick and easy to prepare and if you’re a shrimp lover, you will want to do it over and over again. When cooking asparagus, it is preferable to boil the asparagus a little before so they become tender then finish off by baking in the oven. You can also cook the asparagus directly in the oven but they can be a little dry. Wash the asparagus with water and drain. Chop off the hard stem at the bottom off. 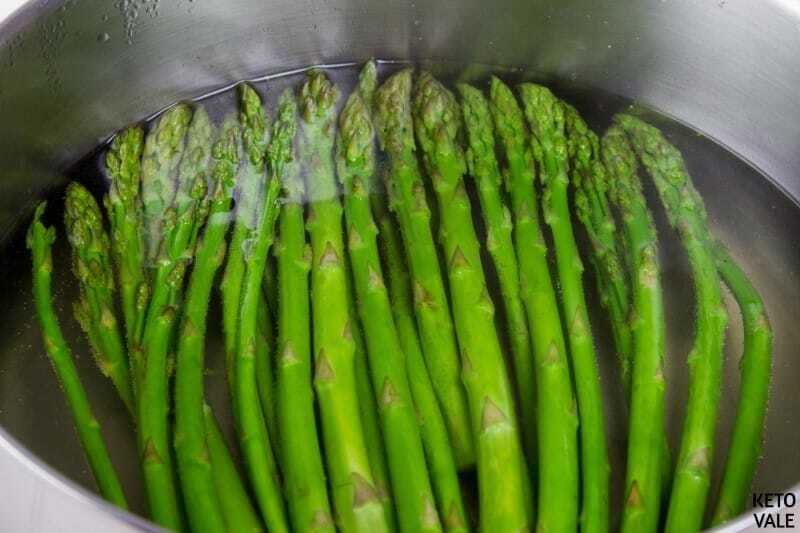 Place the asparagus in a boiling water for 2 minutes only. Drain the water right away so the vegetable will not become too soft. Prep the shrimp by washing them, peeling off the skin, and finally removing the veins. Season it with salt, pepper, leek, garlic and lemon juice. Set aside. 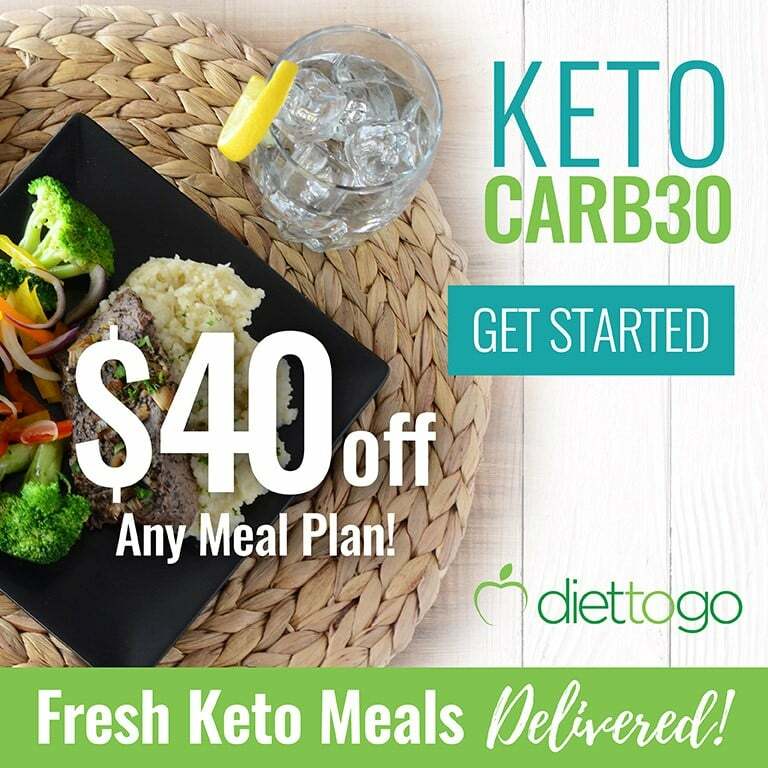 In another bowl, add melted butter, coconut aminos (or soy sauce if not doing strict keto) and grated ginger. Mix well. Line some aluminum foil over a baking sheet. 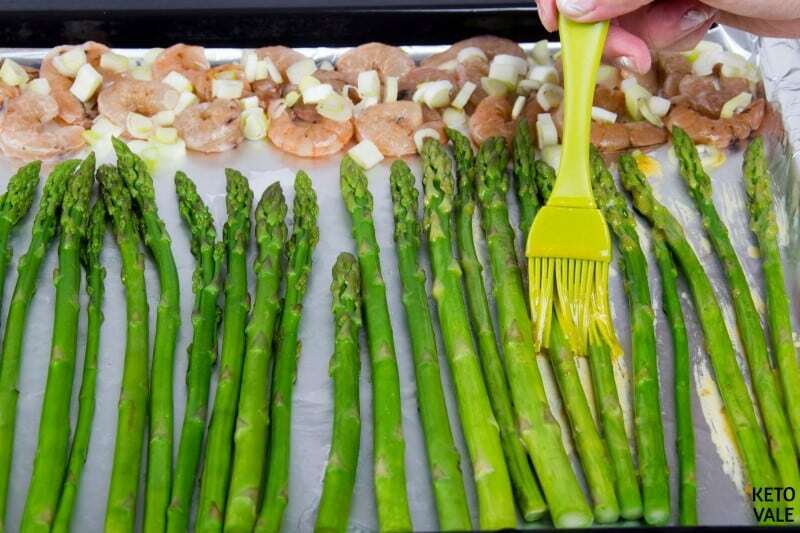 Place the asparagus neatly on one side of the sheet with the shrimp on the other side. Lay the pieces side by side and not over each other. 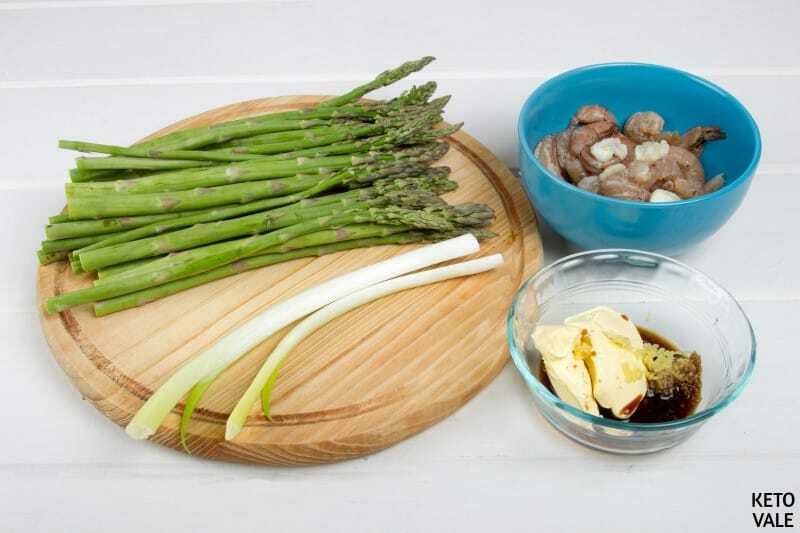 Brush the butter sauce on shrimp and asparagus. You can also add a few slices of lemon and sprinkle chopped parsley onto the tray. 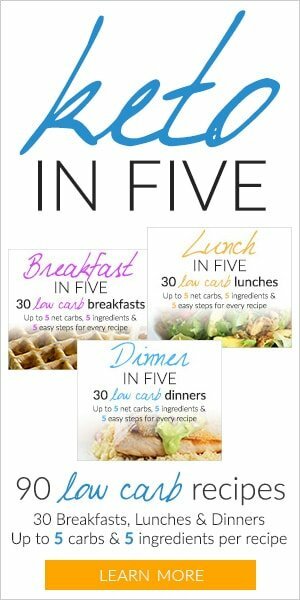 Leave in the oven to bake for 10-15 minutes. Wait till the shrimp is cooked and opaque before serving. Preheat the oven at 350F or 180C. Prepare the asparagus: cut the bottom hard portion of the stem and throw away. Wash asparagus thoroughly and remove any dirt under running water. This step is optional, if you wish the asparagus to be tender, you must boil them in a in a pot with plenty of water with salt for 2 minutes. Strain the water and save the asparagus for later use. Season shrimp with garlic, lemon juice, leek, salt and pepper. In another small bowl, prepare the butter sauce: add coconut aminos, grated ginger and butter. Put it in the microwave for 10 seconds until the butter melts. Mix until a homogeneous mixture is formed. Prepare a cooking tray, cover it with aluminum foil and sprinkle over a little bit of oil. Put the asparagus close to each other over the lower part of the tray as shown in the picture. Place the shrimp on the upper part and cover with the rest of the butter sauce. 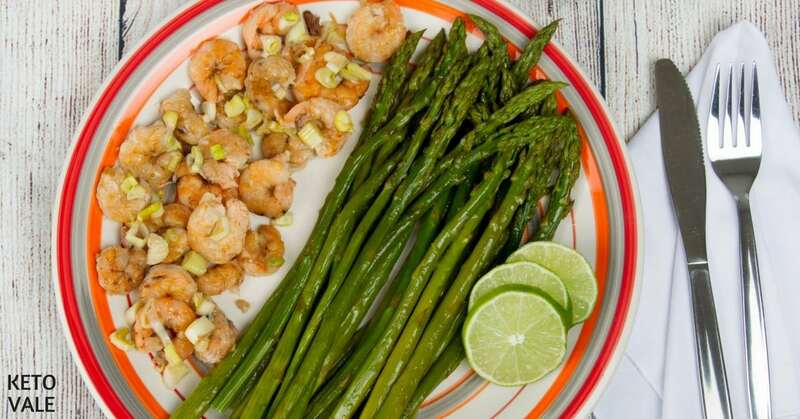 With a cooking brush, brush the asparagus and shrimp with butter sauce. Bake for about 10-15 minutes or until the shrimp turn pink. Remove from oven and serve.